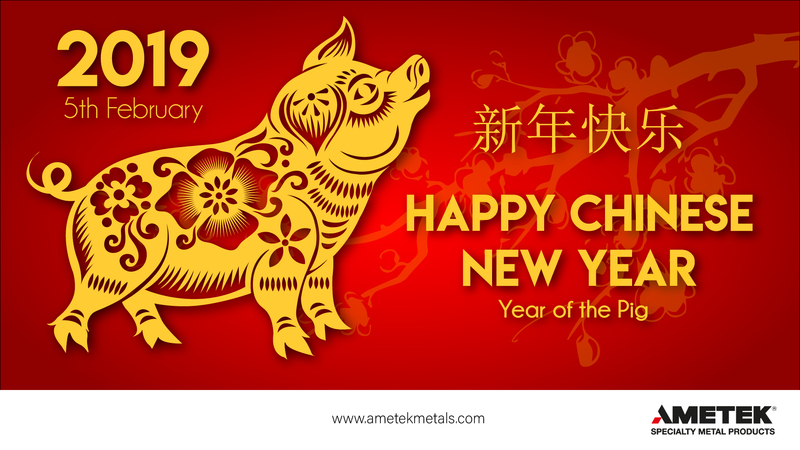 At AMETEK SMP, we’re delighted to wish all our customers and colleagues in China a very Happy New Year – particularly in this Year of the Pig, a symbol of wealth and fortune. China is an important and growing market for the full range of AMETEK SMP metallurgical products – stainless steel and titanium powders, master alloys, high purity strip, foil and ultra-thin foil, and precision metal tubes. Based at the AMETEK office in Shanghai, Michael Zhu, our Regional Sales Manager, leads all sales and business development activities in China and Hong Kong across the full SMP product portfolio. Our high purity metal powders are being used for a range of applications, including thermal spray, metal injection moulding and additive manufacturing, in various industries. We are supplying tubing products to major aerospace manufacturer, Comac, and demand continues to grow for our foil products in the electronics industry. Once again, xīn nián kuài lè!